A bunch of what follows will be about weather phenomena and different kinds of elevation and both were the kind of things that I'm sure seem perfectly normal to anyone living here, but were remarkable, because this was new ground to the both of us. That's a pretty good display of state and national purpose by any measure. Interestingly Whitney gave up counting flags right around 10:40 and it wasn't because there were too many flags. The opposite was the case. Quite suddenly we had arrived in the Texas hill country and let me tell you: there's nothing out here. I mean sure, there are shrubs and grasses, rocks and iron ranch gates every ten or so miles but this is unmistakably the desert. Hill country is also firmly tongue in cheek, at least going by the RPM's poor Omimobile had to push to get us over those mountains. Driving along I-10 I kept wanting to stop so that I could take pictures of the building mountains around us or to get a shot of what the desert looks like. 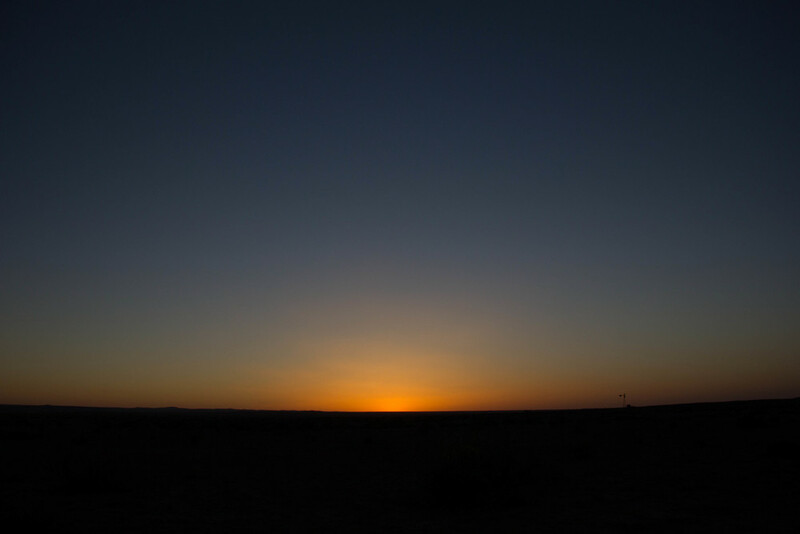 Turns out taking a picture of the desert isn't that easy and I really wasn't satisfied with what I got. Hmmm. As we mentioned in the post from Austin, we had set an unfortunates precedent in driving all day without eating and we followed that to a T again. We're both still shaking our heads. Anyway, we literally stopped twice on our drive to Marfa. Once so I could take pictures and a second time to get gas and switch drivers. ... we checked high and low for a place to eat and there was nothing. Everything was either open Wednesday thru Sunday or open during the day until 2pm or open after 6pm. That was incredibly frustrating. There simply wasn't anything open in the middle of the day where you could go to get hot food. So we found ourselves once again in the situation of being hungry and without food. We're working on it. Jett's Grill, a half mile into town (?) at the Paison Hotel was the place that would finally release us from our gnawing hunger. It's unclear whether the food was that good or whether we were just hungry. At any rate the plate was empty in less time than it takes most people to decide what they'd like to order. Once sated, I took a look around the courtyard at the hotel and kind of got the impression that I was in some kind of a strange world made out of festival hipsters and leather clad motorcycle adventurers. It gave me the impression of being in some exotic semi-perilous desert outpost that adventurers sought out as base camp or way point along their route while at the same time being at the out-of-sight celebrity vacation spot at the end of the earth. We got back to El Cosmico and the wind is kicking up. For the first time we pulled out the four guylines we have for our trusty Basecamp 4 and tethered it to a nearby tree. After a little time of settling in, we turned off our water-headlamp light and cuddled in. It was getting cold. The morning came. Carefully we poked our noses out of the top of the sleeping bags, it was that cold out. What we saw wasn't pretty: a fine earthen, clay colored dust covered the inside of our tent. At this point I'm starting to notice my dried out mouth and Whitney's showing definite signs of her allergies. Overnight, the gusty winds had kicked up the dust outside and swiftly carried it underneath the gap of the rainfly, through the mesh of the tent onto the pillows, sleeping bags and anything else not thoroughly sealed. We were cold, dust covered and had no coffee. I want to deviate from the storyline just for a moment, because I feel that it is important that we inform all of you, just how dusty it was. It just so happened that it was Bob's birthday (Whitney's dad who took us to Nashville and Memphis earlier in the trip). Quick thinking Whitney made the best out of the situation. With a little patience, spit and a camera she made an impromptu birthday card! Briskly we trudged over to the main office and went inside. It was warmer in there and there's coffee. By the looks of it, we weren't the only one's trying to shake off the chills of the night. 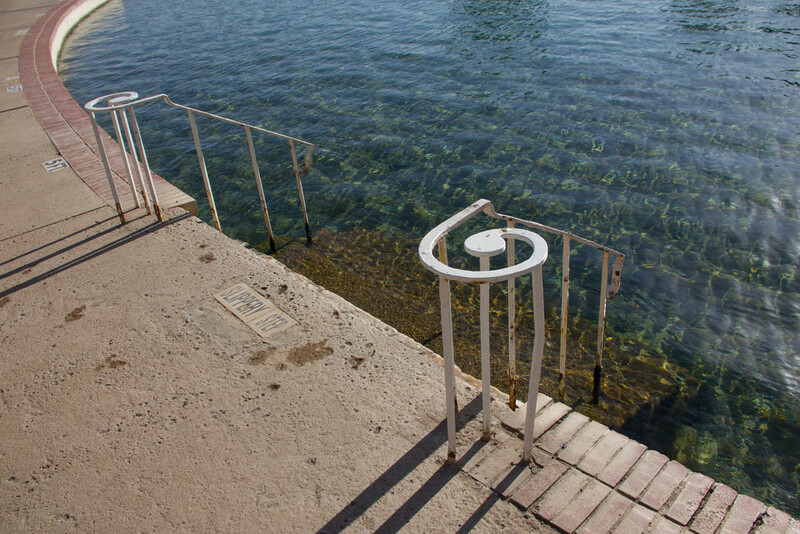 The internet was down though, so any planning we wanted to get done was a no go, so we eventually decided to pick up on a tip from George back in San Antonio and headed up to Balmorhea State Park. Balmorhea is about an hour north of us along Texas route 17, but we had to take the detour via 90, to Alpine and then via 118 back to 17 so that we'd have a chance to refuel and get the oil changed. Do you sometimes drive along and then you see "oh look, I'm running kinda low on gas only have a quarter tank to go..."? 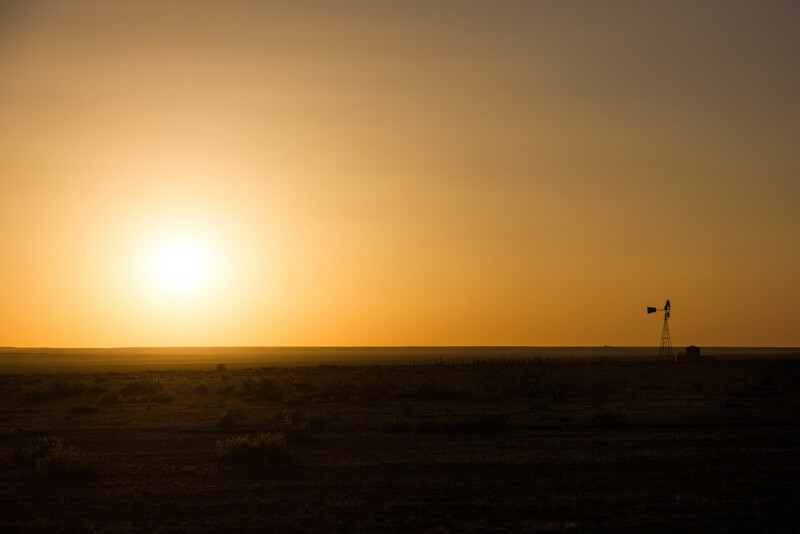 Well, once we had started heading west from San Antonio, and certainly once we'd left the I-10 corridor both of our senses of scarcity particularly in terms of gas had kicked up. I kept thinking about gas in terms of means to get from safe haven to safe haven. Without it, we'd be pretty SOL unless someone happened to find us. Gas stations started to be over 50 miles apart at times so dropping below a quarter task was a no go. The one cactus we found that wasn't "hanging on"
With clean oil and a tank full of lifelinesque gas we set out once again. Guess I didn't mind the detour either, because it led us from the perfectly flat desert through a small group of mountains back out into the desert a few times. Before we met up with route 17 once again at Fort Davis, we stopped so that I could take some pictures and gaze at this barren land that stretched out all around us. Some of the mountains seemed to be dropping rocks on the surrounding landscape, littering it with large boulders. Looking more closely, we could find little cacti hanging on, on the roadside. About every 5-10 minutes a car or truck would pass us. I felt small, alone and peaceful all alone out there. 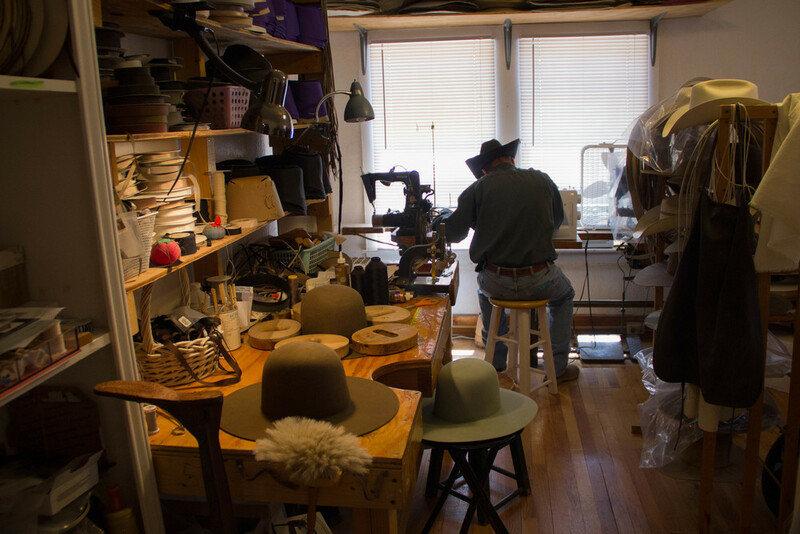 As we entered Fort Davis, Whitney saw a sign for the Limpia Creek Hats company. Since we would be out in the direct sun and I needed something to cover my noggin, we stopped in. The building was a small, three room cottage. We were greeted by John Davis. What followed next was one of the single most pleasant, cordial, and professional sales consultation I've experienced in years. 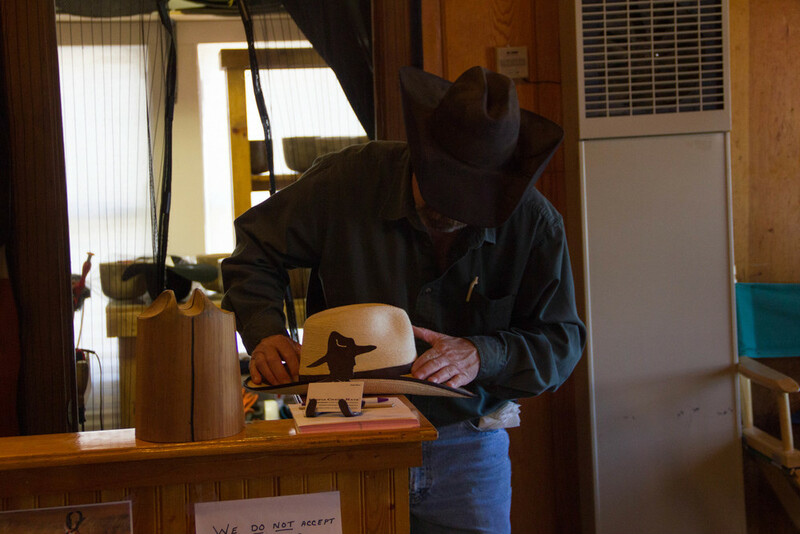 You see as a Yankee, buying a cowboy hat is a bit intimidating. I don't want one of those gaudy "hey look at who just got back from a real rodeo in Texas!" hats, you know? 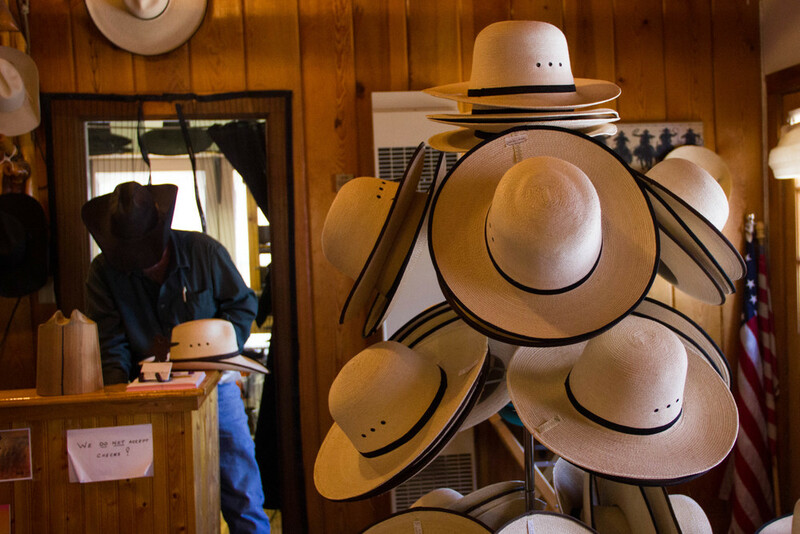 I want a practical and nice looking hat that also happens to be from Texas. Mr. Davis provided me with just that. After picking out a Guatemalan palm leaf hat and a shape, he hand molded the hat, changed the band for me and made sure that the thing fit just so. All while addressing Whitney and myself with more "yes sir" and "mhmm, ma'am"s than I'd ever heard one person utter in the span of an hour. 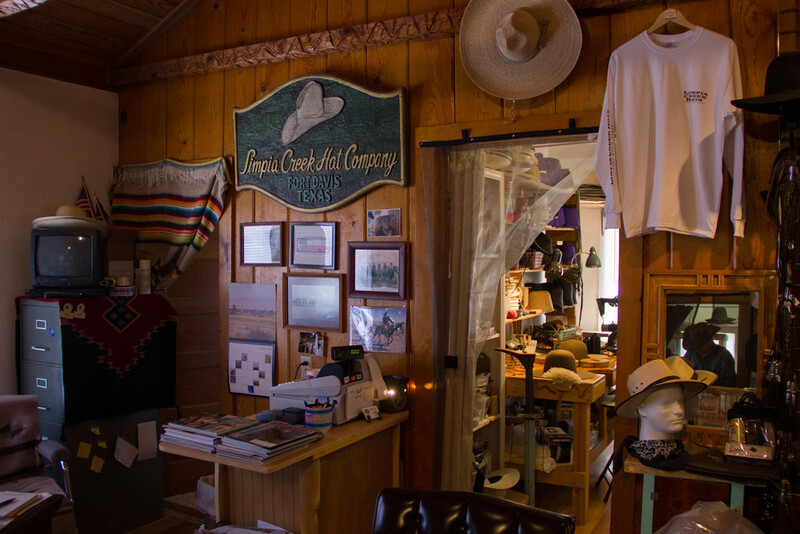 I left a happy customer and would like to endorse this business right here: if you're in need of a quality hat in west Texas, visit the Limpia Creek Hats company in Fort Davis. By the time we pulled off Texas route 17 in Balmorhea, we had an apatite so we stopped at the one (of two?) open places in town for a snack before heading to the park. The park isn't really a park in the way you'd imagine a state park. It's more of a public pool on public land made into a state park centered around the fresh water springs of the San Salomon creek. The weather was cool, but we were dusty and hadn't showered in a couple of days so the temperature was certainly not going to hold us back. After testing the temperature with our toes we carefully climbed down the algea covered steps. 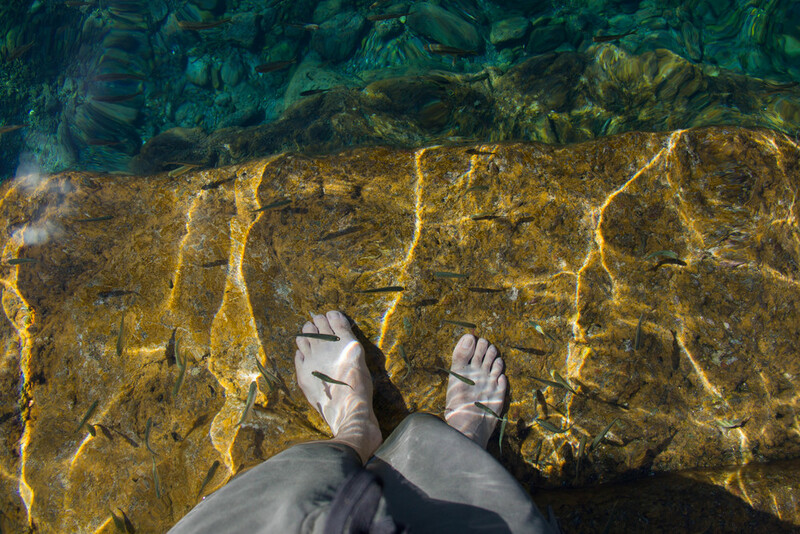 It was very slippery, but the water was oh so refreshing and crystal clear. We'd snorkeled twice before on our trip, but I ran back to the car for the goggles soon so that we could see better what was going on underwater. The only reason Whitney gets to be in the picture is because I can't float on my back. True story. The whole pool is roughly in an L shape with a larger round pool at the joint. The fresh spring water flows in at the top of the L through the round pool and out the other end. 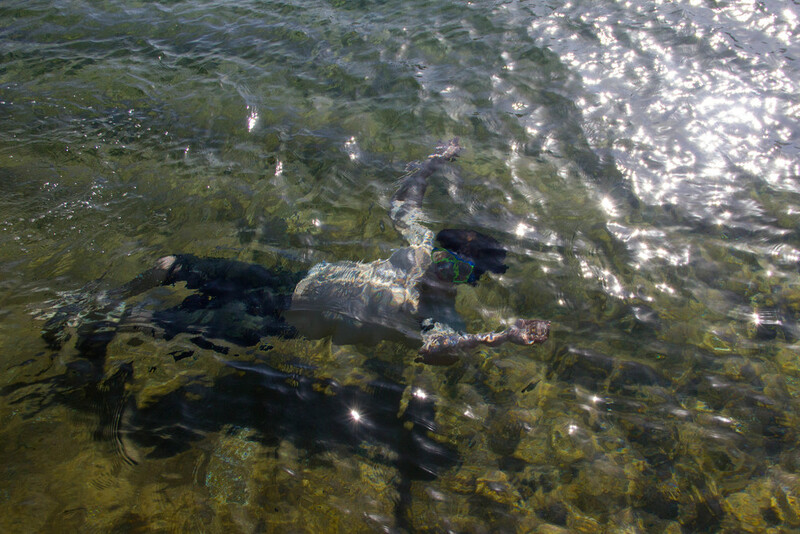 Since it is a natural river it's full of the aforementioned algae but also of scores and scores of little fish swimming around and which tickled the bottoms of our feet when we sat at the edge of the pool. 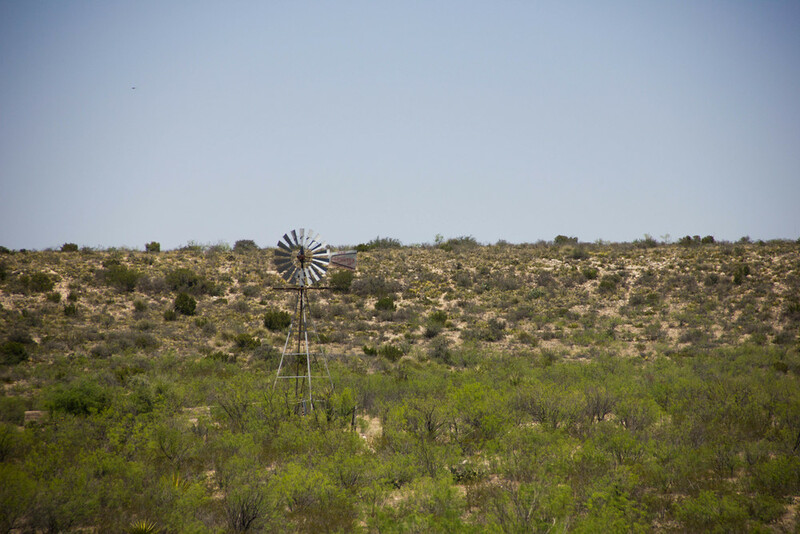 As the sun was shining down on us, we were sitting in an idyllic oasis in the middle of the barren Texas landscape. I think I counted six other people while we were there in an area that could have easily accommodated a hundred or more. Everything's bigger, I guess. Clean and refreshed we headed back towards Marfa. With all this open land around us and the huge Texas sky above us, we thought we'd be fools to miss a sunset while we were here. You see, seeing the sun rise above and fall below the horizon is the kind of thing you make you do when you want to make sure that you positively have nothing better to do. Road trips are time you spend away from (most) time constraints, so a sunrise or a sunset is a quintessential part of that experience. We passed El Cosmico and continued South (passing a Border Patrol check point, our first of many more times in the coming week) until we found a suitable place to watch the sunset about 15 minutes later. We got out and got to see a beautiful red, black, brown, yellow, orange, purple and blue sunset! When we got chilly, we headed back to camp. We cooked a sparse dinner and settled in for the night discussing our idea to trade in our inhospitable post at El Cosmico for a taste of Big Bend National Park. Are we going to pull it off?